Dhaka, Feb 17 (Just News): Hundreds of Dhaka University students staged demonstration at the altar of Raju memorial sculpture on the university campus Saturday morning demanding revision of quota system in government jobs. The students, under the banner of General Students’ Rights Protection Council (Shadharan Chhatra Odhikar Sangrokkhon Parishad) took position on the road from Shahbagh intersection to Doyel Chattar around 10:30am. 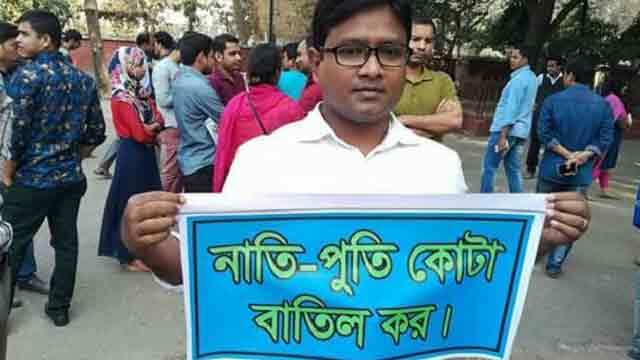 They were seen carrying placards demanding introduction of unified pass marks for all candidates of BCS preliminary test, review of quota system in Bangladesh Civil Services and other government jobs, fixation of 10 per cent quota instead of existing 57 per cent among others. A number of law enforcers were seen around the demonstrators. The protesters, however, left the place peacefully around 12:15pm. Deputy commissioner Maruf of Ramna Zone said for the sake of security of the visitors of Amar Ekushey Book Fair we wanted to keep the area free from any kind of agitation programme.